Realtor’s Charity Putt-Putt Tournament: Having fun and supporting the community! 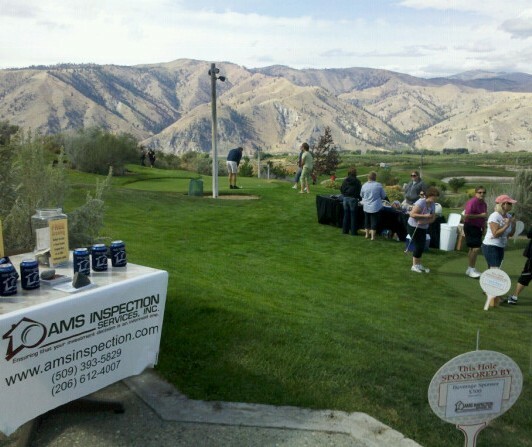 On Thursday our home inspection company sponsored the North Central Washington Association of Realtor’s “Golf for the Good” Putt-Putt Tournament at Desert Canyon near Lake Chelan. The community fundraiser benefitted the YMCA Scholarship Program for Kids, Respite Care and the Wenatchee Valley Humane Society. The day was a lot of fun and we raised quite a bit of money for local charities. A huge thanks goes out to all the sponsors: Wenatchee World, AMS Inspection, Pioneer Title, Mortgage Advisory Group, Pacific Appraisal, Laura Mounter Real Estate, Anita & Larry Day, People Bank, Banner Bank, Numerica Credit Union, US Bank Home Mortgage, Karie Rolen & John L Scott, Cashmere Valley Bank Mortgage, Sangster Motors, Jackie Blanchfield, Jeffers- Danielson- Sonn- Aylward, Ogden- Murphy- Wallace, Johnson- Gaukroger- Smith- Merchant, LocalTel Communications, Eagle Home Mortgage, Carole Keane, NCHBA and Wells Fargo Home Mortgage.